I’m not quite back to brewing beer yet, but a visit to an apiary in the Fraser Valley got me thinking about other fermentation possibilities. I’ve had mead on the back of my mind for a while, but I finally committed to starting a batch this summer. It’s probably important to note that I’m not a huge mead fan in the first place. I’ve had drier interesting meads, but those are usually the exception. What I’m hoping to produce is an interesting base mead that I can balance with spices, tannins and acids. That’s where the idea of combining peach, chipotle and citrus peel came from. I debated a quick 15m boil vs. pitching direct, but I decided a boil for the sake of sanitation couldn’t hurt. My refractometer and hydrometer disagreed about the final OG, it was somewhere between 1.114 (refractometer) and 1.125 (hydrometer) — I’ve been finding that despite being calibrated, my refractometer hasn’t been as reliable as I’d expect. I may just not be using it right. Aside from straight honey and yeast, all that went into the initial ferment was a bit of yeast nutrient and some acid blend for flavour. Fermentation happened slower than normal, with only about 40 points knocked off in a week, and maybe another 40 after 5 weeks. The peaches were added at 3.5 weeks to try and take advantage of still-active yeast while not blowing off too much aroma. Around the two month mark it was clear the yeast had dropped out, but it wasn’t as dry as I wanted. 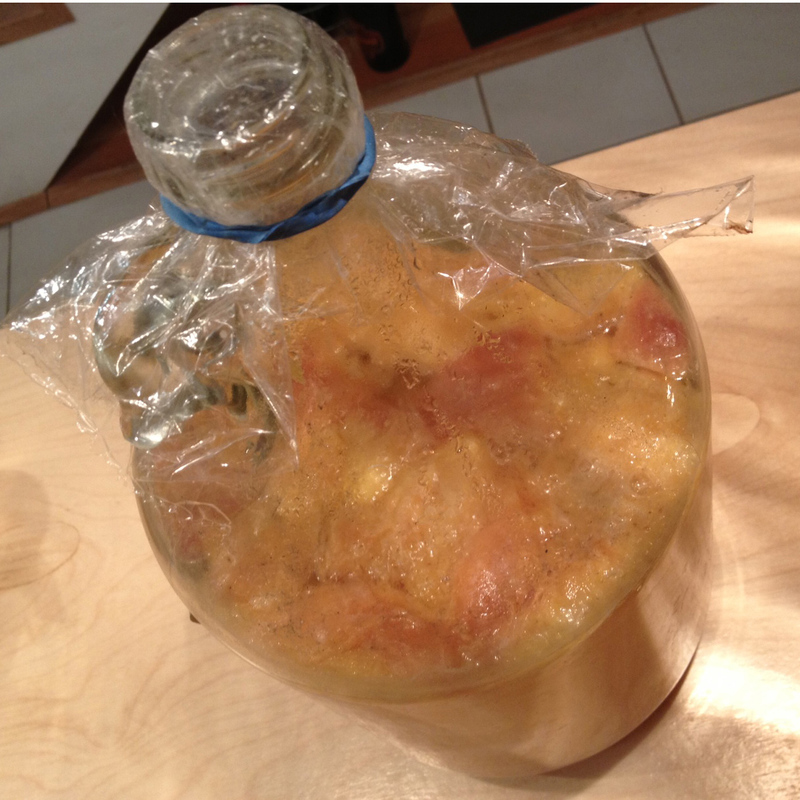 I was also getting worried about the yeast and peaches still in the primary, so I racked it off for the sake of a re-pitch. 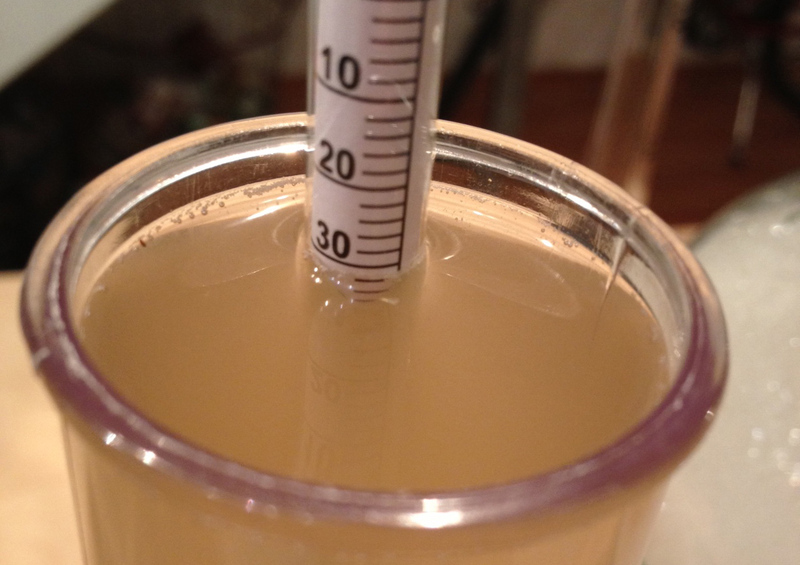 A gravity reading confirmed that at 1.032 it was still sweeter than I wanted, but at ~12% champagne yeast still has a higher alcohol tolerance so I might be able to clean up another 25 points or so with a re-pitch. A few days later I started another batch and reclaimed an extra half liter of 1.100 must, so I topped up this one’s missing volume and re-pitched. Two months later it looks like I over-shot, with a super dry 0.997 finish at ~16% alcohol. I considered my options to correct, but after adding the rest of the peaches I had saved in the freezer for a month and a half, enough sweetness was re-added to cut the dryness and bring it well back into the drinkable range. I doubt this would have been possible if there were still yeast in suspension, but it didn’t appear like the peaches actually fermented. At the six month mark I threw in the peel of half an orange for a couple of weeks. I had always planned to add some citrus brightness to this one, but after a few weeks it produced more of an artificial orange drink sweetness than a tingly citric acid edge, and gave it a bit of an oily texture. I tried a quick chipotle infusion of a week, but that was enough to contribute some extra tannic dryness and enough heat that I can’t quite tell if it hides or accents the alcohol warmth. It came out hotter than I intended, but that should mellow with time. I bottled a bit shy of a year in, it seemed ready to drink as it was going to get, so I bottled.